This article will discuss the ways in which you can improve the insulation within your period property to help reduce your energy consumption and save you money in the long term. Taking considered measures to improve the overall insulation of your wooden sash windows can help to reduce, and cut out draughts within your period home. One way of reducing the heat flow through old windows is to invest in secondary glazing as significantly, they can exceed the performance of new double-glazed sash options. Secondary glazing involves fitting extra glass on to the inside of an existing timber window and if well designed, is unobtrusive. This means you are able to enjoy your home the whole year through and most importantly, stay warm when it matters the most. Of course there are further measures you can take to ensure the very best results within your period home. Insulated blinds, heavy lined curtains and reinstated shutters can be used in conjunction with secondary glazing to further enhance the performance of a single glazed sash window, so your family are comfortable regardless of the weather outside. 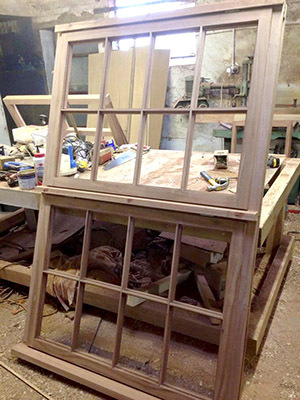 Read more about about sash windows and choosing the right materials for your home to add personality and style to your property.